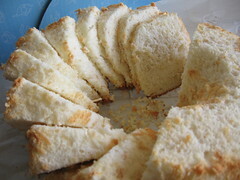 Coconut Angel Food Cake - Do You Know The Muffin Man? Notes: I'm now down to 8 egg whites in my freezer after using 13 to make this cake. The addition of toasted coconut provided a bit of interest in this otherwise boring white cake. My tube pan is 10" across at the top and was completely full; I don't know how this recipe is supposed to fit in an 8" one. Since I was using sweetened shredded coconut, I cut back on the granulated sugar somewhat. This was a huge hit at work, where I served it with white chocolate ice cream.